Italy, you have a spacewalker. European Space Agency astronaut Luca Parmitano became the first Italian ever to walk in space today (July 9) outside of the International Space Station. Parmitano, a 36-year old Italian astronaut , spent just over six hours working outside the space station alongside crewmate Chris Cassidy of NASA, and offered his thanks for an exhilarating first spacewalk. "Thank you," Parmitano said, adding another round of thanks in his native Italian language before signing off. Because Parmitano and Cassidy ran ahead of schedule, the speedy spacewalkers were able to start in on tasks originally scheduled for their second spacewalk next Tuesday (July 16). "Life is good," Cassidy said near the end of the spacewalk. Cassidy and Parmitano also readied the station for the launch of a new Russian module later this year. They installed cables that will be used to power the new Multipurpose Laboratory Module upon its arrival at the station. Parmitano also installed a cover that will protect a docking port where space shuttles attached to the station, according to NASA officials. The two astronauts took some time to appreciate their unique view of Earth as the station orbited about 260 miles (418 kilometers) above the surface of the planet. 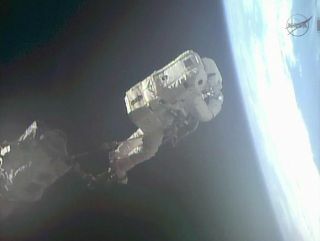 "It's amazing," Parmitano said when looking down at the Earth at the beginning of the spacewalk. Now five-time veteran spacewalker Cassidy checked in on Parmitano periodically to see if his tasks were going smoothly. Parmitano was perched on the tip of the Canadian Space Agency built robotic arm for much of the spacewalk. NASA's Karen Nyberg controlled the space station's 57.7 foot (17.6 meter) robotic arm from inside the International Space Station. "It was fun working with you," Nyberg said as work with the robotic arm came to a close. "It was just like we trained." Cassidy and Parmitano will take to the outside of the space station again on July 16 to continue preparations for the arrival of the new Russian laboratory as well as other jobs. The module is expected to be a staging ground for Russian spacewalks, function as a research facility and docking port, NASA officials have said. The $100 billion International Space Station is the joint collaboration of five different space agencies that represent 15 countries. Construction of the largest structure ever built in space began in 1998 and has been staffed continuously by a rotating crew of astronauts since 2000. Cassidy and Parmitano's spacewalk is the 170th in support of space station maintenance in 15 years bringing total spacewalking time up to more than 1,000 hours.